On behalf of the Governing Council and the entire membership of the Nigerian Insurers Association, I want to thank you for honouring us with your presence today. Your presence today, no doubt is a confirmation of your belief in the Nigerian Insurance Industry. The Nigerian Insurance Industry is a key component and an important member of the Nigerian Financial Services Sector. Insurance as we all know is the bedrock of any economy. In Nigeria, it is rather sad to note that not all have embraced this concept. This is why the penetration rate still remains about .5% as against some other African Countries such as Kenya and South Africa with penetration levels of 2.9% and 14% respectively. Also only 1% of our population hold any form of Insurance Policy. The reason for lack of interest in insurance may be as a result of lack of knowledge about the benefits of insurance. Let me therefore, use this opportunity to highlight some of the benefits of insurance to the economic growth of our nation and indeed the entire world at large. Offer protection to firms and organisations. In this way, their financial stability is enhanced through the taking over of any damage or interruption in the production process occurring as a result of the insured events. Insurance promotes entrepreneurial attitude, encouraging investment innovation and vitality of the market. Insurance offers relieve and by so doing reduce pressure on Government. Insurance, through Life Insurance Companies provide funds for long-term investment in the real economy. In the absence of a risk transfer mechanism like Insurance, economic activities would be much lower and hence will result in economic loss. Also, in the absence of Insurance, human behaviour, particularly risk aversion would either lead towards avoiding these activities or excessive precaution and both of these actions would result in an economic loss. Also to be noted is that risk transfer mechanism will reduce fear, anxiety, frustration or demoralisation which can reduce productivity in the environment. Insurance also encourages creativity, innovation, entrepreneurial activities and trade that are vital for sustainable growth. Despite the lingering apathy for Insurance by the Nigerian populace, driven largely by ignorance, on one hand and cultural and religious beliefs on the other hand, the Industry remains resilient. In 2016, the Industrys Gross Premium income stood at N316billion as against N252billion premium income in 2012, an increase of 25%. The growth is significant in Life Insurance segment particularly in Annuities. Also, to be noted is that Nigerian Insurance Industry continues to record increased claims payment. In 2016, total claims paid by operators amounted to N113billion, as against N73billion paid in 2012, an increase of 55%. 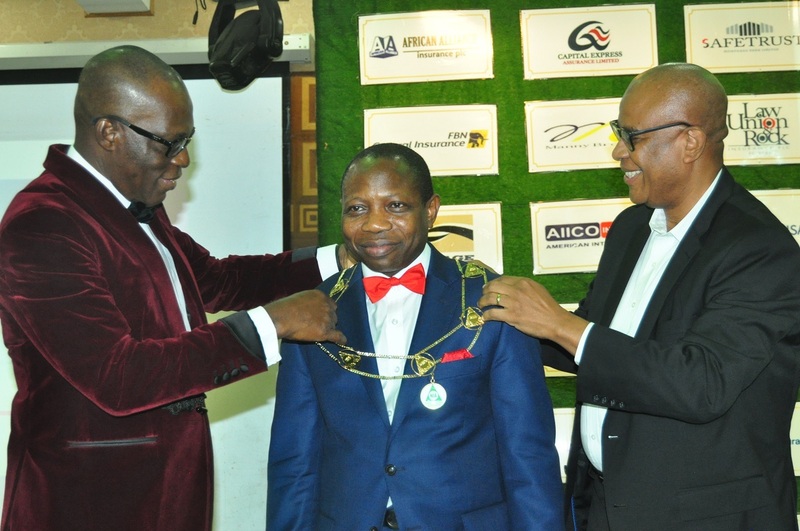 Chairman, distinguished guests, permit me to use this opportunity to pay accolades to all my predecessors in office whom I refer to as the Body of Past Chairmen for the contributions they have made towards the development of this Association. I like to thank specifically the immediate Past Chairman, Mr. Eddie Efekoha for the height he took the Association to during his tenure. By the grace of God, I will build on these lofty achievements. Ladies and Gentlemen, you will all agree with me that, as an Industry, we are not where we are supposed to be. Our image has been battered and more often than not, we have been made to play a second fiddle to some other professions. I say enough is enough, to this treatment. It is in the light of the above that I have adopted a theme NIA First, Insurance First. Specifically, I shall be focusing on the following which I call a 5 Point Agenda. They are collectively referred to as 5Ps. These 5 Points Agenda will give the direction of my service to the Association for the next 2 years by the grace of God. Protection of Interest of Members Companies. Proper positioning of the Insurance Industry. There are various ways. Deployment of good technology to drive our operations, development of human capital, reaching the unreached setting and working towards a financial inclusion target for the industry, putting in place, an excellent customer satisfaction mechanism, increase insurance awareness through many channels, build capacity for the industry are some of the ways by which we can properly position the industry. Improve the standard of professionalism. Many of you will agree with me that the level of professionalism in the industry is very low compared with global best practice. The rates charged more often than not for risks presented for insurance do not correlate with such risks. There is need to have a total departure from this practice. Risks survey, inspection and business procurement procedure are most times, sometimes relegated to the background. We need to address this in order to take this Industry to the next level. The NIA will collaborate with all other stakeholders in the Industry in order to tackle these various issues. In my opening remarks, I talked about the low level of Insurance penetration, particularly when compared with other markets in Africa. Presently, for a population size of about 200million, Industry penetration is less than .5%. You will all agree with me that this is not good enough. We must collectively work together to increase the penetration level. In this regard, NIA will work with all arms of the Industry such as Brokers, CIIN and NAICOM to achieve this. Chairman, Guests of honour, Ladies and Gentlemen, as I round up, I have no doubt in my mind that the task ahead is quite challenging, but I believe very strongly that with the help of God, and the support of everyone of you we shall achieve success. Therefore, as members of Insurance Community, we shall continue to come to the table with strong engagement and education. There must be a paradigm shift. People must begin to see Insurance not as a product, but as a process. I must not conclude this address without paying tributes to the Almighty God who has made today a reality. I return all the glory to Him. I like to also thank the Chairman of this occasion, Special Guests, the Commissioner for Insurance and everyone for sparing time to attend this event. I pray that the good Lord will bless you abundantly in Jesus name.